I wish you a wonderful, sunny day - enjoy it as much as you can. You really deserve it! But there is something else for you - and for all who would like to read - the second (and last) part of "The rat". I hope, you will like it! A/N: please, read Part one of this first! One week later. Weekend. It had been an distressing, lonesome week. Every afternoon Casey rode with his bike aimlessly up and down the area. Searching for good motives for his newest photoprojekt, as he told his mother, but the truth was another one. He just wanted to be alone. He couldn't even bear Zeke around him. He did everything to cheer Casey up a bit , but nevertheless he only reminded him of the little dog. She had liked him, she had trusted him. There would have had to be another way. It had been cruel and hardhearted to leave her alone. He missed her, he felt bad and he asked himself if she was okay. Was she still at the animal shelter? Or had someone adopted her and gave her a nice home now? Once he had asked Zeke to drive with him to the shelter to look after her. But Zeke shook the head. "What's that in aid off, Case? It won't make things easier. It's just gonna hurt if you see her again!" "Oh, overly punctual," he heard murmuring his mother in the bathroom when the bell rang. "Casey, can you open the door, please?" "Okay," he answered and wondered who it could be. Maybe Mrs. Brown, an elderly lady who sometimes came over for a small talk? Or uncle Harry, his dad's brother? He often came here for dinner. Casey groaned at the thought of him. He didn't like him. He was always so annoying with all his questions about school, girls and his plans for the future. But maybe it was his grandma. Casey's face brightened. This would be a really nice surprise. Casey loved his grandma and he hadn't seen her for a long time. "Hey. I think, it's high time to cheer you up a bit!" "Your Mom has invited me!" "My Mom did .... what? Are you kidding me?" Casey's head jerked round sharply at his mothers voice. "He's not. You have a nice friend, hon. I don't know at all, why you kept him secret for so long!" Casey gasped. It felt like a dream. His mother thought that Zeke ... was nice? She had invited him? And Zeke was coming, though he always had stubbornly refused to get to know his parents? His whole world was turning inside down. Zeke's voice jolted him out of his thoughts. "Good! Ready for another surprise?" Casey stared at him bewildered. Zeke stood grinning in front of him, swirling around his car key. "Oh Jesus ... You will do it? You will give me a driving lesson?" "No chance, Case! I know, you would like it, but ... not with my baby! I would have to kill you, if you crashed it!" He thrust the key into his hand. Impatiently he opened the car door with a jerk. A little, hairy bit rushed at him, jumped around him, barking and whining at the same time. It was evident that she remembered him. Casey bent down to the frolic dog. She jumped into his arms and licked over his nose. Casey giggled. Zeke observed the scene grinning. It felt good. He knew he had done the right thing. He had struggled with himself for two days until he was ready for it. Up to now he had always wimped out when Casey invited him.There were only a few people he was afraid of. Casey's parents belonged to them. They could be rigorous, though they were fair and they cared for Casey. Zeke might not imagine how they would react at him. He knew, he was the "bad boy of Herrington", best known for his wild parties and his shady dealings. The truth was a bit different - but who cared? Definitely not Casey's parents. They would just be terrified that he could bring Casey into trouble and Casey would be banned from any further contact to him. But he didn't want to lose him. It was the only thing, he ever had Casey asked for: Don't tell your parents about our friendship! Casey was sure that his parents would get to like him. He just had to give them a chance. But Zeke was not ready for it. It was too hard for him to trust other people, because they mostly had disappointed and betrayed him. Finally Casey had accepted this and he stopped bothering him. Casey came over to him, with the dog in his arms. His eyes were sparkling. "You did it!" he said. "You've brought her back! Now she can stay with you, right?" But Zeke shook the head. "Like I've told you: In my house is no room for pets, not even for rat-like dogs!" Casey's face turned to stone. Helplessly he glanced form the dog to Zeke and back again. He couldn't get it! What was the point of all this, if he didn't want to keep her? And what the hell was his sappy grinning supposed to mean? This was definitely not funny! "She belongs to you, Casey!" Casey looked across to his mother. She was still standing at the door and observed the scene. He swallowed. "This cannot be! She can't stay here! I have told you! My Mom, she ... "
"I always liked dogs. But she ... She was so scared when I found her. But then I knelt down to her, she started wagging and everything was okay. She trusted me from the very first moment. She is ... she is someone special, you know!" "Yeah, looks like this! Well, I think, we will get used to each other. Sometimes she acts a bit wildly, but she is charming! It's hard to resist her." "She can stay here? She is ... she is mine?" Casey gamboled around with the dog in his arms. "Do you hear this? You can stay! You are mine! Mine! Mine! Oh my God!" Casey chuckled and let her go. Then he ran over to his mom and threw both arms around her. "Maybe you shouldn't thank me. Thank Zeke!" "He can be very persuasive! One evening he suddenly stood in front of our house, with this little rascal in his arms. We talked a long time. I think, it wasn't easy to convince us, but finally he got us!" Casey narrowed his eyes and looked at Zeke questioningly. How could he miss this? Zeke shrugged. "Wednesday. Your extension art course. I knew, you wouldn't be at home! I didn't want you to be here. I didn't want you to be disappointed, if they would say 'no' !" "I must admit, I was quite surprised. Why did you never told us that you are so close to Zeke?" "Oh well, I ... we thought ..."
"I see! You're worried, we would forbid you to see him again? Yes, probably we should do it. Zeke's rep is not the best ... "
Casey threw a look at Zeke. He smirked and shrugged. "Well, she's right! I'm not an angel, you know!" "But you are not as bad as they depict you. Mom! You can't do this!" "Calm down, hon! If he would be so bad, he wouldn't have done what he has done! He really cares about you, do you know this?" Casey saw Zeke blushing. He giggled and put a quick peck onto his mom's cheek. His mother laughed and turned around. "Little charmer! Well, dinner is waiting. I'll have to look after it. And you ... you should look after your dog. If she won't stop digging over my flower beds, maybe I'll have to change my mind!" Casey knew, she was just teasing. But he grabbed up the little dog and put her back onto the porch. "First thing you'll have to learn," he murmured. "Never - upset - mom!" Then he went across to Zeke. He smiled at him, he wanted to say "thank you" for all he had done. But he was lost for words. "There is no need for it," Zeke finally muttered. Zeke stared at him a moment long, then he cleared the throat and shrugged. "You don't have to thank me. I just act as selfish as ever, you know. Your bad mood wasn't bearable any longer!" A pull and tug at his shoelace jolted him out of his thoughts. There was someone, resolutely demanding his attention - and he was all too ready to give it to her. While he played with her, something crossed his mind. "I wonder, if she can sleep in my room. I would love to take her with me into my bed ...."
"Like you said, Casey: Never upset mom! This is not a good idea. Better we'll go to the pet shop and buy a little, nice dog basket for her!" "Zeke! This would be great! Oh, she needs so much. A leash. And maybe a ball to play. Or one of these squeaking rubber toys, they are so much fun. And feed! She needs feed. And maybe some dog treats. And ... we can't go yet!" Zeke looked at him amused. He loved to see Casey so effervescent with joy. He also did so every time, when he found a new, phenomenal photo motive. Then he talked his head off, the world around him was forgotten. "We can go whenever you want!" "We'll have to wait till after dinner. Mom would be quite peeved if we vanished into thin air now!" "Oh yeah, it's dinner time! I should go now. I don't want to come across pushy!" "I'm sure, it's gonna be okay if you stay here for dinner. My Mom likes you!" "I like her, too. They are nice, your parents! They have listened to me, you know. They took me serious. Mostly I am just ... Zeke Tyler! The bad boy ... "
"Yes, they are nice ... even if they are just ... parents! Sometimes is quite difficult to deal with your parents!" "Sometimes it's quite difficult to have none!" Casey swallowed. There it was again, the sadness that always took possession of Zeke when he thought of his parents. He tried to hide it, but Casey knew, how much he sometimes longed for a family. "Oh well, but now you have us! If you need someone to talk to or whatever, I'm always there for you. And my parents would also help you if they can ... and Ty, of course!" "That's her name! I'll call her Ty!" "Oh God, she will hate me!" "You?! Oh, I get it! You think, it's because of you?" "Sorry, Tyler! But Tayla is a wonderful girls name! Hey, Ty, you like your name, don't you?" Casey looked at the little dog. She looked back, directly into his eyes. Casey smiled. Zeke could suspect whatever he wanted, but he would never know the truth. The reason why he promptly had fallen in love with this little dog. He had seen into her eyes - wonderful, brown, sparkling eyes - for the very first time, and he knew it. She was abandoned and alone. She longed for warmth und nearness. She needed someone to love her. Yes, I wanted a fluffy ending for the boys (what a surpirse ;) ) and the little dog. What a lovely ending, I knew Zeke was going to do something about that dog for Casey but didn't quite know what. How neat that he'd arranged the surprise with Casey's parents. Off topic Prisca, who does your wallpaper for you, they're gorgeous and creative? Yes, I wanted them all to be happy: Zeke, Casey, his parents and, of course, little Ty! Wallpaper? Well, I like playing around a bit with "Photoimpact" - but I think, others can do it much better. It's just learning by doing - and sometimes (only sometimes!) something come out in the end. It's just for fun! What a lovely conclusion to the story. Zeke really did everything he could to bring about this change in Casey's world. Such a small thing, a pet, but so wonderful to Casey. 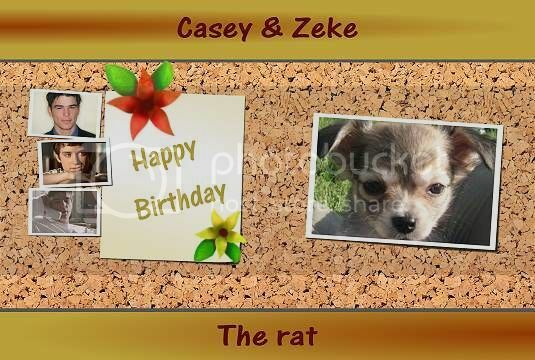 And in the process Zeke has let Casey's parents see that he is caring and thoughtful and a good friend for their son. The new family is bonding together over this little dog and Casey's need to love. Love the choice of name and of course the reason he fell for her was a very nice secret! Thanks for this second part. And I think your English is fantastic! Should you lie? ;) I know my english is not as good as it should be, but ... well, it's over 20 years ago I've learned it at school and I never really used it later. Thank you for your great comment. I'm glad you like this story, it was so much fun to write. I really like the name Tayla Ann. Awwww, that's soooo beautiful, sweetheart. Thank you so much for this lovely birthday gift. Great story, wonderfully and lovingly written. I just LOVE it, my dear! Love and zillions of hugs to you, my friend. Thank you, Julchen. I'm so glad that you like this chapter. Zeke, the Softie - oh god, don't let him hear this! But, yeah, sometimes he is! And I like Casey's parents as cool and nice ... mostly.